The area under consideration is the marine-land mass interface belt in the Konark-Puri transition area. Balukhand-Konark Sanctuary was established on the sandy tract covered by plantation of casuarina and cashew trees, along the coast between Puri and Konark. It is well served by the marine drive road. Spotted deer abound in the area but the star attraction is the rare Black-buck. This area falls under the ecologically sensitive zone, where there is a wildlife sanctuary, called Balukhand Konark Sanctuary. The Puri township is adjacent to the western boundary of the sanctuary. Two rivers, namely the Nuanai and the Kushabhadra, which are subject to tidal influences, pass through the sanctuary and the river mouths are part of the sanctuary area. The sanctuary plays an important role in maintaining agricultural productivity of the hinterland by arresting the erosion of land. It also contributes in recharging the freshwater levels up-ground and prevention of seawater ingress. The Talabani area, adjacent to the sanctuary boundary on the western side, is extremely important for the Puri town as a sweet water zone and thus has to be preserved at any cost. The land is also the source of more than 30 springs, which are renowned for their myriad wildlife-they are home to more than 300 species of rare plants and animals. Location Located in the District of Puri between Longitudes 850-52’and 860.14’(east) latitude 190.48’ to 190.54’ Date of notification 23 April 1984, revised on 01 Sept. 1987 Area 71.71Sq.kms. Forest type Casuarina, Tamarind, Anacardium, Karanja, Polanga, Neem etc. Villages None Climate Winter temp is approximately 100 C in Summer temp rises above 400C Wild animals to be seen Spotted Deer, Blackbuck, Stripped Hyena, Jungle Cat, etc. Suitable period for visit Round the year Convenient approach The Puri-Konark Marine Drive road passes through this Sanctuary---. Puri is only 3 km from the Sanctuary--- entry point. Officers to be contacted. Divisional Forest Officer, Puri Wildlife Division, Bhubaneswar. Accommodation There is no accommodation within the Sanctuary---. Tourist can stay at Puri or Konark where a good number of hotels of different categories are available. 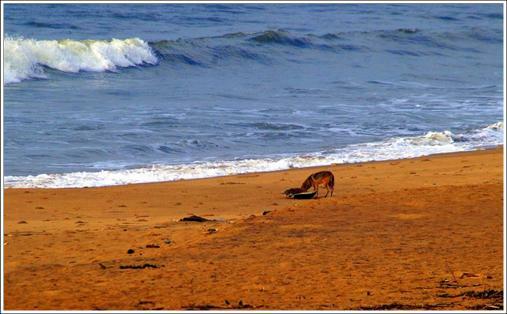 This sanctuary is stretched along the coast of Puri –Konark and is well known for spotted- deer and other wildlife. The other species found here are Black-Buck, Hare, Olive Ridley, Jackal, hyenas, Jungle cat, Monitor lizards, etc . But with the passage of time, the effective area of the sanctuary has strunk further due to human encroachments and ever growing anthropogenic pressures. Further now with several institutions (educational) and small industries having come up all around this sanctuary more biotic pressure is being put on the sanctuary precincts. On an average more than 2000 people daily go inside the sanctuary for sustaining their livelihood, which results in habitat loss and degradation for the fauna residing. So they usually stray into the fields of villagers in search of food by crossing the sanctuary limits which results in Man-animal conflict and road kills. 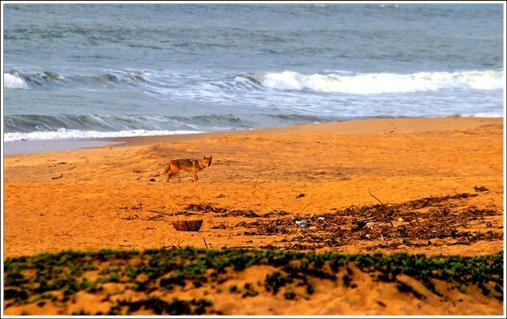 The greatest threat to faunna residing in that place is the national highway connecting Puri and Konark which passes through the sanctuary. As per officials records on an average 5-7 deers are injured/killed in road accidents in a month. Apart from above, vehicular traffic has been increasing manifold over the years causing disturbances to the wildlife. Olive Ridleys undertake sporadic nestings on the coast, but trawling has been killing them in large numbers. On other occasions the ridleys fall prey to Jackals, Crow, etc. which are natural predation. This area was almost completely planted many years ago with Casurina and Cashew, with the result that local flora was almost replaced. However some small patches of this local flora exist and need to be conserved for biodiversity. The gradual destruction of habitat by human pressures will lead to growth of weeds. Involvement of local community/people in the conservation of Balukhand-Konark ecosystem had not been forthcoming. It was being felt that without the participation of the locals long term conservation efforts in this part will not yield results. There are numerous villages surrounding the area with established infrastructural facilities like schools, hospitals, roads, panchayats, etc. Poaching goes on with the involvement of the local people. 1. Orissa, Balukhand Sanctuary: In the Gada Bangar Reserve Forest area a proposal to develop a large tourism project was shot down a couple of years ago. It seems this idea is once again being mooted. This Balukhand-Konarak Sanctuary forms a contiguous belt within this forest and if the (Rs. 500 crore) project is allowed it will irrevocably damage the fragile coastal ecosystem. Apart from turtles, horseshoe crabs also come ashore here. At tremendous cost a wind-break forest has been planted and protected for years. All this may be sacrificed to make way for multinational tourism companies who wish to exploit its tourism potential by building more than 25 five star hotels, commercial complexes, helipads etc. 2. Apprehensions have been raised in the near past about the threats to this fragile habitat. On the issue of a proposed university (Vedanta), the issue of the boundary of the proposed varsity touching the sanctuary, has invited serious apprehensions. It has been opined that industries, processes and operations within eco-fragile and eco-sensitive zones around sanctuaries needed regulation. 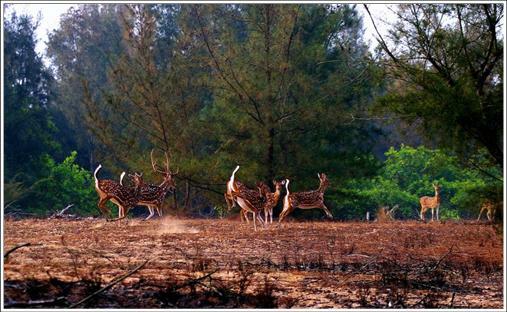 The Balukhand-Konark sanctuary, notified in 1984, affords security and habitat protection to about 3000 deer and antelopes including more than 100 black-bucks. Demands have been placed asking the state government to seek permission of the Union ministry of Forest and Environment before setting up varsity in close vicinity of the sanctuary. It has been stated by the Orissa Forest Department that the sanctuary plays an important role in keeping agricultural productivity of the hinterland, and due to this a belt of one km width around the sanctuary area should be protected. However a distance of 10 km upstream from the sanctuary boundary along the course of three rivers, Nuanai, Kushabhadra and Prachi, in Talabani area adjacent to the sanctuary boundary on western side is extremely important for the Puri town. As per the Orissa Forest Department these areas should be a part of the eco-sensitive zone of the sanctuary and should be preserved undisturbed. The eco-sensitive zone on the seaward side of the sanctuary boundary should also extend upto 5 km into the sea from the high tide line. 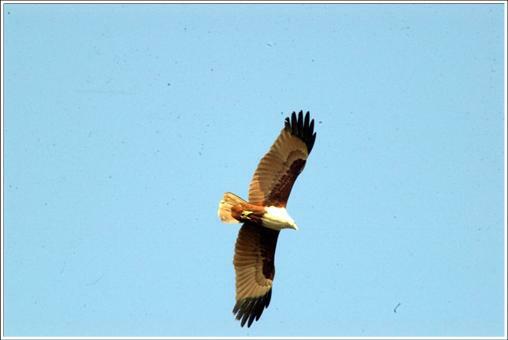 In view of the above facts, Wild Orissa launched the Balukhand-Konark Wildlife Conservation Program during October 2008 with financial assistance provided by its Mumbai Regional Chapter in Mumbai and as well generated in Orissa . Mr. Dipti Ranjan Patra, a 3rd year B.Tech student in the nearby technical institution was appointed as the Program Head. 1. Rescue and Release Snakes On an average nearly 5-6 snakes are rescued and released into the sanctuary premises daily. A common cobra rescued from Balukhand area and later released in the sanctuary. Such events have a deep impact in the minds of Target Group viz. local communities and helps in spreading commitment for conservation of wildlife and nature among the countrymen. 2. Rescue and Release of Deer Spotted deer which stray into the fields and gets bitten and injured by dogs, are treated and released into the sanctuary. On certain occasions however the animals die. 3. EDC Interactions At present Wild Orissa members are interacting with the Eco-Development Committees (EDC) members to create awareness about flora and fauna and their impact on ecosystem. Some EDC s have invited Wild Orissa to be part of their advisory board. Interactions with Eco-Development Committees (EDC) regarding reports of wild animals being kept in illegal captivity and sensitizing them to release them. 4. Patrolling Patrolling has been taken up in a small manner in the bordering areas of Balukhand WLS to monitor illegal activities concerning the flora and fauna. Some villages like Bangara, Bhua, etc have been found to rampantly fell trees to meet the requirements of local restaurants and hotels. One of the major reasons for deforestation in this area is due to the mutual conflicts between the EDCs over the collection of cashew nuts. To check such activities our members have to visit the region more often as compared to what they were doing during 2008. 5. Poaching Some villagers have been found to be involved in poaching activities. In this regard there have been meetings and interactions with forest department for combating the same with local support. 6. 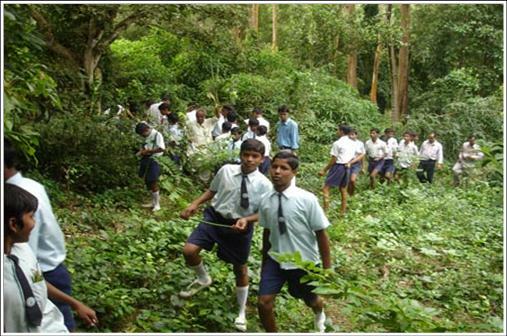 Forest Treks School children have been involved in forest treks. 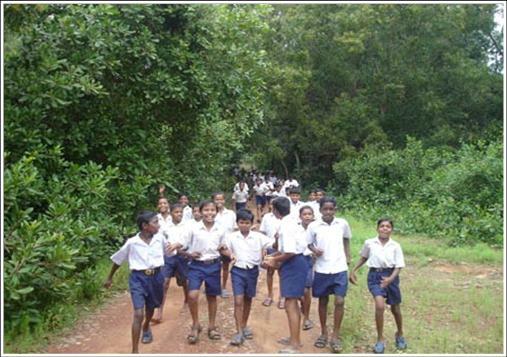 Students of Samagara High School and Baliguali High School had taken part in forest trek organized by Wild Orissa. 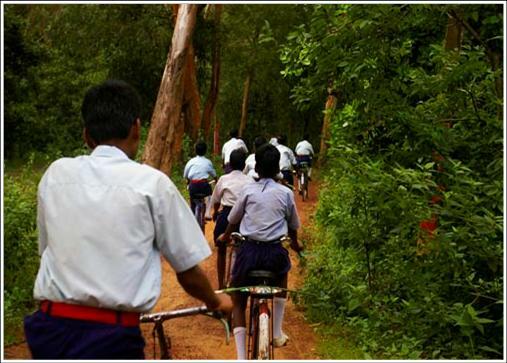 Nearly 100 students accompanied by forest personnel went for an hour trail inside the Balukhand-Konark WLS. In the meantime they were taught about forest ethics and recognition of forest plants/trees and their usefulness. This event was ended off by planting 100 berry and medicinal plants inside the sanctuary. 1. 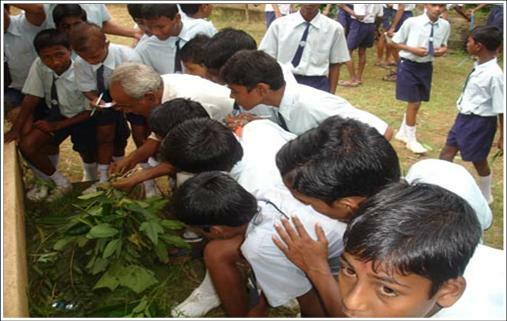 Plantations of local species have been organized in association of the forest department involving of children. 2. 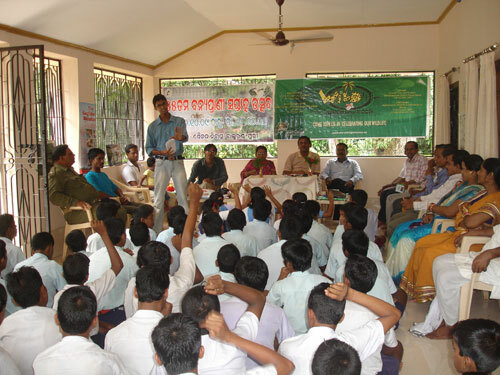 Sensitization of School Children Interschool competitions have been organized by Wild Orissa with conduct of essay writing and slogan writing. Essay writing competition was held on 07/10/09 at Puri Zilla High school while the slogan competition was held at Nuanai Nodal High School on the same day. Nearly 300 students from different schools had participated in the said events. The jury to examine essay and slogan competition comprised of 3 retired Head Masters from different Govt. Schools of Puri. The competition was categorised under two sections i.e Senior and junior group. In senior group, students from class VII-X had participated, whereas in junior group, students of class IV-VI had participated. Some students had written excellently well and had touched the aspects of Man-Animal conflicts and need for conservation of wildlife for sustenance of our lives. This competition indeed has a great impact on young mind and will motivate them to work for conservation of wildlife and nature. 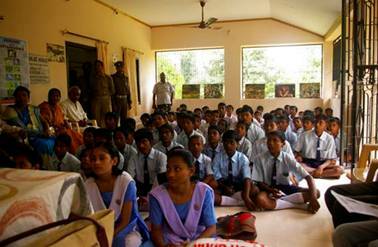 Sensitization On Snakes A workshop on conservation snakes was organized by Wild Orissa at Saikat Niwas to make the target audience (Students and forest Personnels) aware of the facts about snakes. Students were taught how to deal with snakes if they would encounter them or the precautions needed to be taken if they were bitten by snakes. For this event Mr. Sagar Panda of Snake Helpline was invited and interface provided with school children. There was an interactive session between target group and us which lasted for an hour. This event was appreciated by forest and school officials and they requested for conduct of similar workshop in different school in the near future. 4. 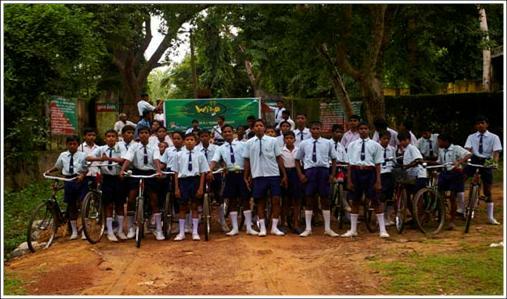 Awareness Campaign A cycle rally was organized by Wild Orissa involving nearly 100 students from different schools on the 7th October 2009. The rally started from Saikat Niwas to their respective school. The Assistant Conservator of Forests, Puri flagged off the rally. 5. WILDLIFE CENSUS Members from Wild Orissa associated in the annual wild animal census during 2009 and 2010, which was conducted by the Orissa State Wildlife Wing. 6. 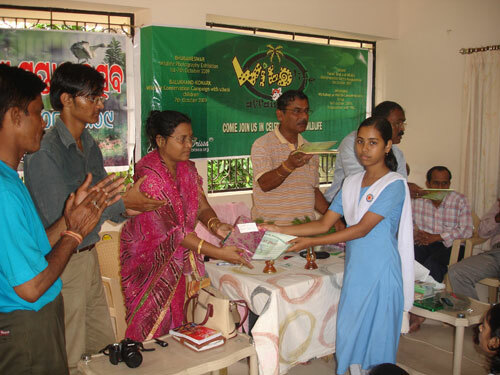 WILDLIFE AFFAIRS 2009 Wild Orissa’s annual wildlife celebration program WILDLIFE AFFAIRS for the year 2009 was organized at Bhubaneswar, Dhenkanal, Arjunapur and Balukhand. 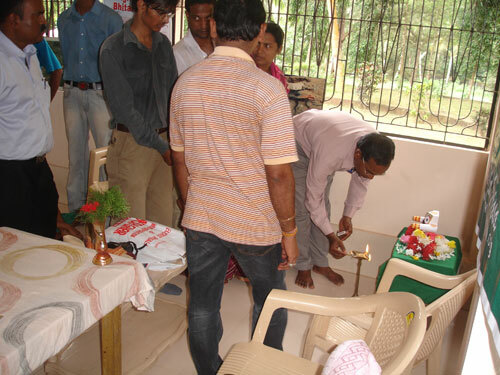 The program at Balukhand was held on the 7th and 8th of October 2009. Prizes and certificates were distributed to winners of inter school competitions. A Best Forest Guard was also given. Best Forest Guard Award 2009- This award was presented to Mr. Bana Bihari Mishra, Forest Guard, Puri Sadar for his sincere efforts towards conservation and dedication to his service. This event will motivate others for their service to wildlife. 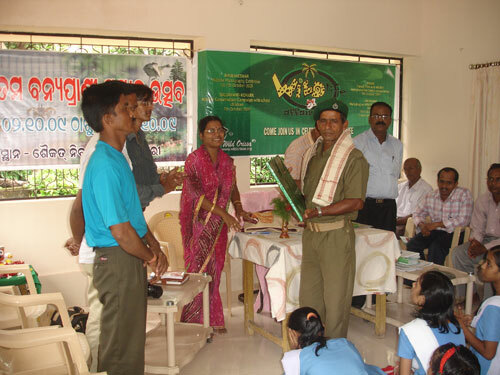 Best Forest Guard Award-2009- Mr. Mishra is being feliciated here. · Immediate steps need to be taken to fill up staff vacancies and for a Veterinary Doctor round the year to treat the injured animals and birds. Nearly 4-10 deer die on an average in a month due to accidents. In Balukhand range there is only one forest guard and no forest watchers at all. 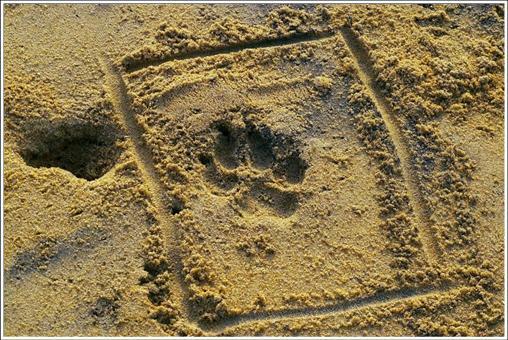 · Tourism management needs to be immediately streamlined inside the wildlife sanctuary. Tourists are being given a free run of the sanctuary without compulsory guides and are littering with polythene. Implementation of rules is extremely lax. · Effective monitoring/patrolling practice need to be employed in the reserve and the foresters must be provided with VHF sets in order to communicate with their officials. 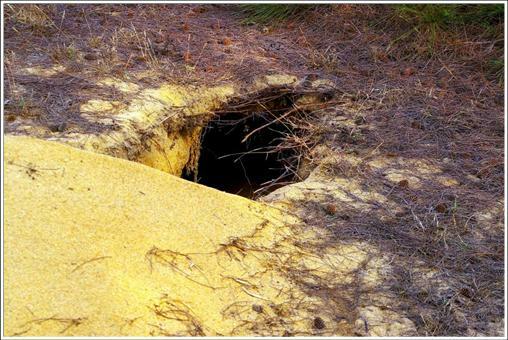 · All the illegal entry points should be closed with a gate or the road must be cut by digging channels like trench. Presently there are hundreds of roads made by the villagers which are well connected with the highway. Deforestation is major problem for this reason. · Deer regularly stray into the village area in search of food and water and get injured by the dogs. Even the villagers sometimes stab them to death. 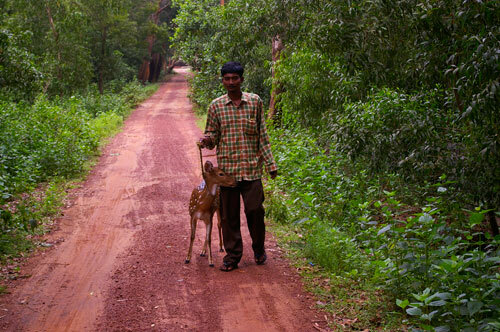 One can easily find a deer as pet in the adjoining villages close to the sanctuary. Initiatives needs to be taken to develop the habitat as there are no meadows and a few fresh water pools inside the sanctuary to accommodate deer population. · Wildlife cross the road and stray into the field in the evening hour i.e. from 7-10 pm. 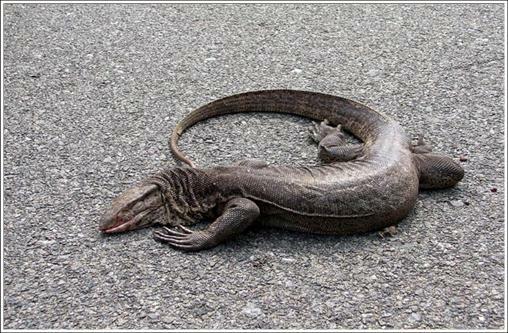 They are often hit by high speed vehicles. So initiatives must be taken to close the Puri- Konark highway during these hours. The coast of Balukhand Wildlife Sanctuary must be proposed as a No Fishing Zone as few Olive Ridleys come for nesting.